Typically, the majority of us are not so ready to share our age, even though everyone says age is just a number…but, every time a business turns another year older it hopefully signifies positive attributes like Stability, Trustworthiness, and Integrity. We are striving to get better, not just older. 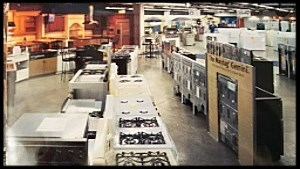 We opened our doors on June 13, 1980…under the name Aggressive Appliances and Fine Furniture. The furniture aspect didn’t “stick”…now, we focus solely on residential appliances, and have undergone many changes over these last 37 years. Some of us have had some laughs looking at photos from the past, mostly enjoying the changing hairstyles and mustaches of our staff. 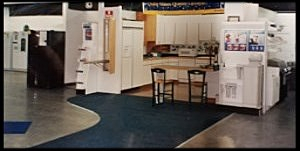 Our showroom has changed dramatically over the years, starting with a small building on Hwy 50, and now we get to share state of the art “live” kitchens and 10,000 sq ft of shopping space with our customers. Thank You to our customers for your loyalty….we so appreciate your business and before we know it , we will be in our 40’s ! Second Harvest…..Our Favorite Neighbor ! Remember the Mister Rogers Neighborhood song with the line….won’t you be my neighbor? Well, if you clicked on the link, that song will be playing in your head for awhile…you’re welcome for the walk down memory lane of forgotten tv shows. Our favorite neighbor is Second Harvest Food Bank. A few years ago, one of our customers invited me to a graduation for the Culinary Training Program at Second Harvest. Since then, we have developed a partnership that has brought us great friends and experiences. 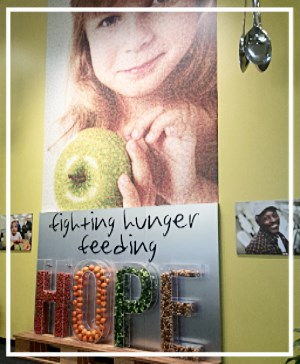 It has been wonderful over the last several years to learn about all the accomplishments of Second Harvest in the community….and even better, to be able to help spread the word, and educate others about this great organization. We have enjoyed the talents of the chefs of Second Harvest, as well as the culinary students. 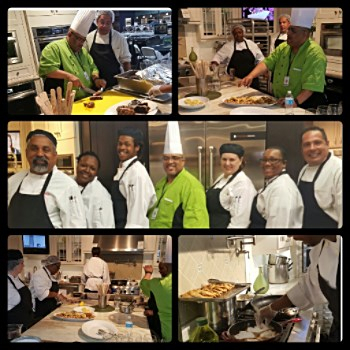 We often involve the students in our “food” events in the showroom….it is always our pleasure to have a small part in contributing to the culinary training program. Students enrolled in the program gain valuable “hands-on” experience learning in our production kitchen assisting in contract meal prep and catered events during their lab time with our team of award-winning chefs. The life skills component of our program prepares students for work-readiness, focusing on the importance of appropriate work behaviors, resumes and interviewing techniques, as well as household budgeting, stress relief, and time management. Just last week a graduate of the program stopped by to say hello…one of my favorite things is getting to know these students, attend the graduations and hear that everyone has received employment or is in the process of interviewing for a job in the culinary field. One of the latest groups we have had in the showroom is in the picture below, under the supervision of Chef Israel, serving great food for our customers and staff. Here is a peek at the meal…. 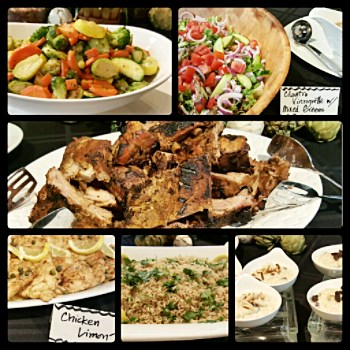 It goes without saying….we love great food and the people cooking, grilling, baking, sautéing, and preparing that food ! Another fun benefit of knowing our neighbor is participating in the Chef’s Night Dinners throughout the year. Aggressive loves to sponsor a table and invite some lucky recipients to a fabulous evening right at Second Harvest….the most accomplished chefs in the area create an outstanding menu and they never disappoint. Anyone can buy tickets to these events and help support the Culinary Training Program….simply go their website and check out all the ways you can be involved. 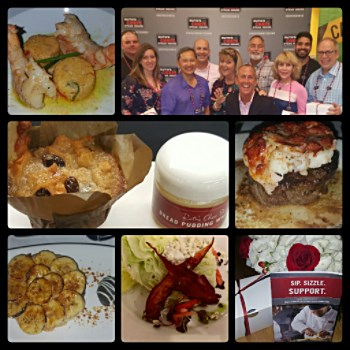 We recently attended a Chef’s Night just this month, Ruth’s Chris was in the house with their top chefs from around the state….the meal was perfect from the beginning appetizers, to the take home box of bread pudding…perfection ! In addition to getting food to families, children and seniors, Second Harvest has many services that benefit the community. a Catering Program, Distribution Center Training Program, Kids Programs, and too many services to list here. Take a few minutes, go to their website and see for yourself how Second Harvest Food Bank is transforming lives, right in our own backyard. It’s a good thing to be their neighbor. Yes, we are an appliance store and we love to talk about and sell appliances….but, we also love our community and the people that use those appliances. Thank you for letting us share about our neighbors. What is stainless steel? When it comes to appliances stainless steel is considered a color. It really is a finish, a very popular finish, but not everyone loves stainless steel. Avoiding stainless steel for new appliances isn’t always black and white. There are shades of grey and red and blue and green and…..
With stainless, more and more we get the fingerprint complaint. Yes, stainless does show finger prints more readily than painted finishes. If you have been licking your fingers after scraping the cake batter bowl you will most likely be leaving a sticky mess on any finish, no matter what color. Not everyone has the dexterity to touch only the handle so when visiting our customers we do often see fingerprints at kid heights or even nose prints at Labrador retriever height. For years, Viking Range Corp has offered special order finishes in several colors. 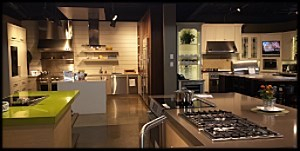 BlueStar is famous for their ranges but now has a great line-up of cooktops, ovens and hoods as well. The BlueStar name came into being when Prizer Painting (yes, a paint company) purchased the residential division of restaurant range manufacturer. So it’s no surprise that a special order of a new BlueStar can arrive in nearly any color as well as a variety of metal finishes. We mentioned KitchenAid’s new Black Steel a few weeks ago (Link to KitchenAid’s “Black Steel My Heart” Blog); many of our customers think it looks awesome. If color alone won’t meet your design requirements, check out the classic designs of AGA’s Cooker, La Cornue’s French design, and Viking’s Tuscany Series. Vent-A-Hood goes a step further and doesn’t just offer traditional, classic and modern hoods in stainless steel and painted finishes, but allows special orders on their hoods in brass or copper with custom applied metallic trims. Go crazy with it! 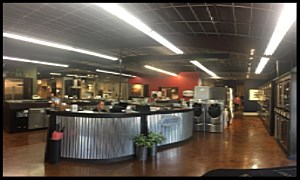 In keeping with our tradition of being the best appliance dealer in Central Florida, Aggressive Appliances has all of these products on display with the exception of Viking Tuscany due in soon. Don’t pass up the chance to see the Duck Egg Blue Aga, three different La Cornue ranges, and two custom Vent-a-Hoods. Construction is underway!!!! There is dust, noise, hot air, and adventure flying all through here!!! There’s palpable excitement in the air when things start coming down and change is on its way. The only thing that stays the same here at Aggressive is that you can always count on change. We’ve set up a handy “DETOUR” sign trail to the bathroom since the usual way is closed off due to the re-construction. The signs are a hoot and so are the signs Jerry’s created and posted on the glass windows in the back office for people to giggle at on their trek to the restrooms. We’ve even found one of Tina Wilson’s wall murals for the former summer kitchen section hidden behind walls we took down!! Can you make out the plane? How cool is that?!?! ?